If you're over the snow already, raise your hand. The resulting salt and grime are brutal to shoes, making many of us walk around in clunky rubber boots. I guess we still get fashion points for cool beanies and blanket scarves, but this season makes it hard to show off a good shoe game. I refuse to be defeated, so I've made it my personal mission to collect shoes that don't make me feel like a total schlumpadinka. Many of mine are no longer available (the ones you can still buy are in the Shoes N Booze Amazon Shop), but I went on the hunt to find a few perfectly stylish options for you. And since we're at the end of the season, they're all on sale!!! I've reviewed Cougar boots on here before (see! ), and they are definitely warm. This quilted wedge boot has a bit of Napoleon Dynamite appeal, but minus the dork factor. It's available in four colors, and it costs less than $100. Buy your pair here. The chelsea boot has become synonymous with cosmopolitan cool. Hunter's version features neon rubber tread and waterproof leather. The really great thing about these is that you can wear them whether there's snow on the ground or not. They're almost $100 off right now, so hurry to Hunter's website and snag a pair. Melissa's glossy rubber boot is playful, yet polished. The lug sole keeps you from slipping on ice-slick streets, and the stretch inserts keep the fit cozy. It's half off the regular price on the Melissa website. 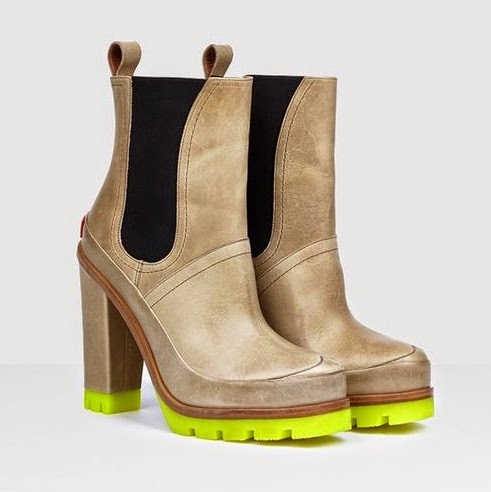 Inspired by arctic expeditions, this Polo boot features neon quilted panels, a platform and a chunky heel atop a lug sole. It's relaxed enough for the weekend, but it's also a good choice for afterwork drinks. This upgrade to the classic duck boot is currently down to $139 from $450 on the Ralph Lauren website. How do you stay a step above winter? Do you have a favorite pair of heels that are snow-apropo? Let us know in the comments.